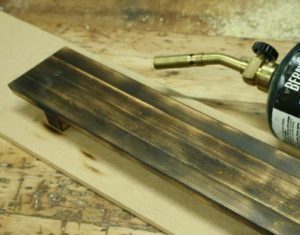 This is how to age wood the easy way, with 23 awesome techniques that you can start doing right now in your own shop. There are so many great ways to make new wood look old, and if you are looking for easy methods, this is your perfect guide. Enjoy. 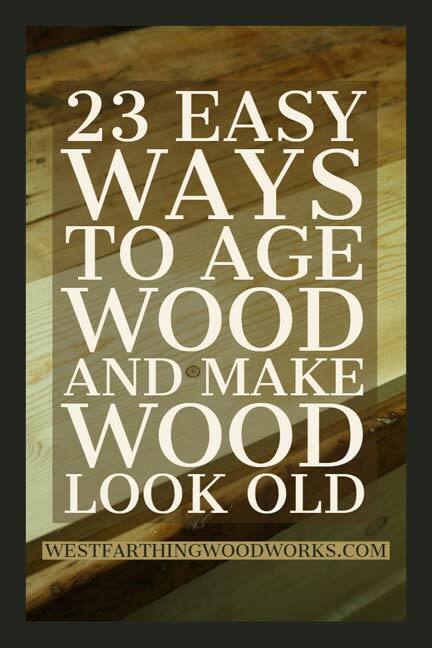 Your Guide to Making New Wood Look Old and Aging Wood the Easy Way! There are many reasons to age a piece of wood. The most common of reasons is that there is romance in older furniture. Older pieces tend to be revered among their owners, and newer pieces not as much. The logic behind it may come from the fact that an older piece of woodworking has stood the test of time. It’s seen years of use, probably some abuse, and has served it’s role well for all the time. Perhaps, with some care, it can continue to serve as reliably. Older pieces also have a lot of rustic charm to them. There are dents, dings, scratches, and missing paint. It’s more than just the look of the flaws though, it’s the stories. Each of those defects has a story attached to it. They give the piece history, and life. On newer woodworking, there is no history. 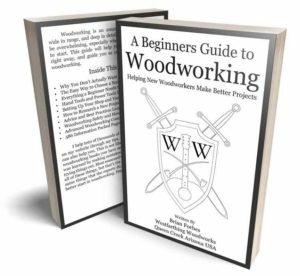 For the modern woodworker, there is big money to be made by aging wood artificially in the shop. It’s a funny thing, but rustic and aged pieces tend to sell for more than new looking pieces. 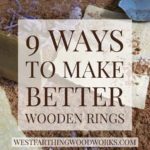 Whatever your reasons for making new wood have an antique look, these 23 ways are sure to help you. Here is the list before we go into each one in more detail further down in the post. Enjoy. 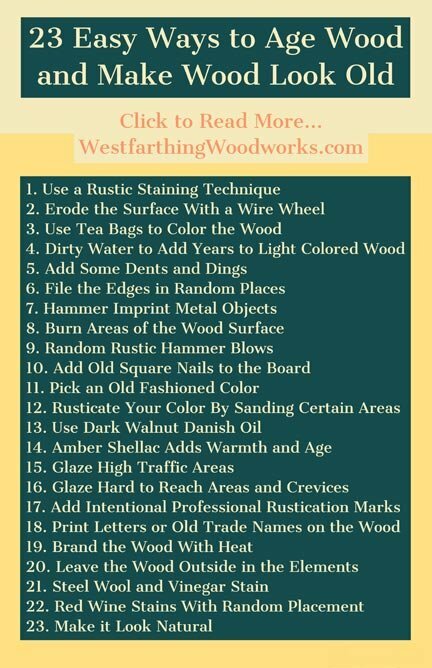 One of the easiest ways to age wood is just to use a rustic staining technique. If you are already familiar with staining wood, this will not be much of a change. The difference is in the application, and that’s about it. To stain wood with an old and rustic look, you need to intentionally leave an uneven surface. You can do this the most effectively with a medium color of stain. A medium brown is great, because you can go heavy in some areas and light in others. You can also wipe the majority of it off in some spots, and let it really soak on others. The difference between the intensity of color will give the look of age. It also gives the look of an older staining product too. Older stains were not as good as what we use now. They did not apply that easily, and they did not penetrate as evenly. As a result, older stains tend to look more uneven, with lighter and darker areas. For another step in making new wood look older than it really is, a wire wheel is a high energy, and very aggressive way to age your piece. A wire wheel, either on a grinder or in a hand drill is a way that you can remove a lot of material from the surface, but in a rustic manner. It creates a bold usually textured design. The wires or bristles on the wheel do all the work. When you make contact with the wood, the bristles scrape off the softer wood areas, and leave the harder areas. As you go, you will notice that the grain lines tend to look more pronounced in the end. The look in the end is of a board that has been weathered through erosion. It’s as if the surface was left out on a strong sandy wind for years on a beach. This of course happens in a matter of minutes with the wire wheel, but the look is ancient. You can also vary the look depending on how you treat the wood. If you go light with the wire wheel, you will not add as much character. However, if you go heavy you can really add some depth and dimension to your wooden piece. Sometimes, a light coating of another natural color can be all you need. In the case of aging wood using household items, tea bags are perfect. You should look for dark teas rather than green, and buy a whole box. Black tea works well for this process. A strong tea solution is easy to make, just put a lot of tea bags in hot water and allow them to extract all the color. From this solution, you wipe the surface of the wood, paying attention so that you cover the entire board. Tea stains for the most part are not that intense. Some woods can take more than others, but in general this adds some dirtiness to the wood surface on lighter pieces, and may not have much of an effect on darker pieces. Like any wood finishing technique, it’s best to test. Try out a few small test pieces with your tea stain, and see what you get. Once you find a combination of finish and wood species that you like, you will have your recipe for doing a larger project. 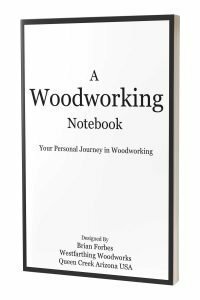 Your Personal Journey in Woodworking! Available Now on Amazon! A trademark feature of aged wood is dirt, dust, grime, and sometimes even worse. You can add these things artificially in your building process, and create the same look. Don’t go nuts though, because a little goes a long way. Also, depending on what you want to use the piece for, avoid anything greasy. One of the easiest ways to give an older look to your board is with dirty water. The best part is, you only need a couple ingredients to make it. You need dark colored dirt or dust, and water. That’s it. Literally all you need to do is gather some dust and dirt, make a liquid, and brush it on your wood. Make the liquid really dark, but still allow the liquid to flow. Once you apply it, the coloring effect will not be as dark. Once the piece dries, it will be even lighter. The point of this distressing technique is to simulate the piece being in storage for a long time. You can use some 0000 steel wool after it’s dry to remove the loose dirt from the surface. Over the years, dirt and dust build up like a layer on a wooden object. Adding the dusty, dirty layer yourself is just a way of speeding up the aging process. Test out your ideas and mixtures first on scraps. This way, you know what it will do before you have to commit. As a piece of wood ages, it naturally receives damage. The most common damage comes in the form of dents and dings. You can easily age your project simply by adding some of these features in the build. Most pieces become damaged in the high traffic areas first. They also become damaged on easy to dent places like edges, sides, tops, and anything that sticks out too far. In order to make your damage look authentic, you need to address these areas first. You can do the damage with a rolling pin, short piece of heavy pipe, or anything else with some weight that you can bump with. Simply bump the edges or corners, and add some dents and dings to your project. It’s easy to go overboard with this technique. Please resist that urge. You only need to add a few little bumps to make the piece look naturally aged. 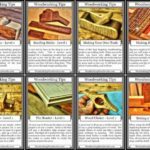 Also, if you combine this technique with one or two more from this list, it can be the last little touch that really sells the wood as being older. The edges of your project are going to become damaged over time. This is true of all woodworking projects, but mainly of larger furniture pieces. This naturally happens as pieces are moved, stored, and kept for a long time. 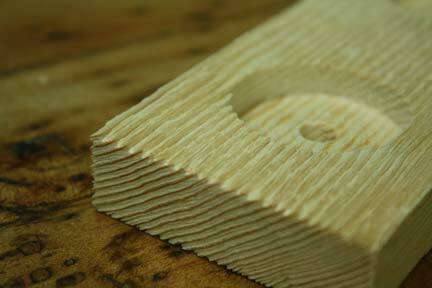 You can use this to your advantage and age your wooden project by addressing the edges with a file. The file is great because it’s rough. You can cut through the material on the edges quickly, and the tool is inexpensive. A round file is the best for making your table edges look old. Look for one that tapers, with the base being at least half an inch in diameter. This gives you the most versatility, because you can make larger file marks or smaller file marks. Run the pile straight down in one spot, and create a small crescent shape in the edge. If you like it, make more. If it needs to be deeper, file it again. These marks can instantly simulate damage over time, and make your new project look older than it really is. An interesting feature of aged wood is imprinted objects on the surface. They can be whatever you want them to be, but think of the style when you do it. Think of things that would normally encounter your project, and those are the best to imprint. 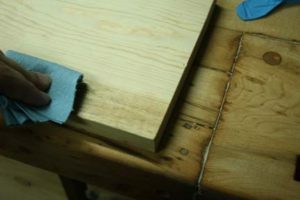 For example, if you are making a rustic wooden bench, then you can expect to see tools, screws, nails, and things of that nature on the surface. You might also expect that at some time, something heavy was dropped on the bench, imprinting the shape on the wood. 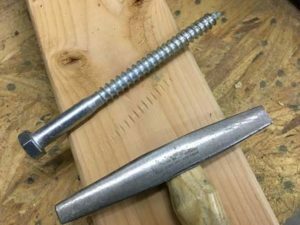 For this example, bolts, large nails, washers, nuts, springs, and anything you would find on a workbench is perfect for impressing on the surface. All you need is to gather a couple of those objects, and find a good hammer. Place the item on the surface where you want the indent to live. Then, give it a good smack with the hammer. Plan this out, and be careful when you swing. You will only get one shot to make the hit. Also, avoid your fingers. Finally, don’t hammer the same piece over and over. What will happen is the design will end up becoming blurry. This is because it’s really hard to get the piece in the exact same spot. As you hammer over and over, the slight movements make the indents look rough. Practice a little, and you will be able to make these kinds of marks in one swift hammer swing. If you play around a little with the pressure too, you can get different looks from the different items that you imprint on the wood. Add this to another technique from the list, and it’s a good touch in moderation. Don’t go over board with it though. The goal is to look like naturally aged wood. Burning is one of the most fun ways to age wood, and make it look older than it actually is. You get to play with a blow torch, and you get to be artistic. Depending on how you approach the design, you can get an extremely wide range or results too. The easiest tool for this is a simple blow torch and propane tank. You can find these in any home improvement store for a low price. While you are there, get a couple bottles of propane too, just in case you need them. It should go without saying, but you need to do this in a safe area, and with a fire extinguisher handy. You are in control of what happens in your shop, and you can easily burn the place down using a technique like this. Do your homework, and be safe. Starting out on the lighter end of the distressing scale, you can simply toast the corners and edges of your wood. This gives a nice look, and the dark edges stain really well in contrast especially if you are using a lighter stain on the rest of the piece. This is a classic look, and can add years to your piece. On the rougher end, you can burn away a much more significant amount of wood. You can create pits, round corners and edges, and really go to town. The charred area can be washed away when the wood dries, and these pits look really interesting. Make sure to experiment a little before going to the real thing. The last thing you want to do is go rogue and ruin your project. Play around with a scrap piece of the same species. Get your technique down, and you will be happy you did. One of the best parts about this Rustication method is you can learn it in an hour. Just work with the torch, see what it does, and pick the looks you like. This is by far the easiest of all the Rustication methods, and nearly everyone reading this should have the tool they need. A couple random hammer blows to the surface of a piece of wood ads age instantly. Don’t go hammering the heck out of your project. A series of one to five hammer marks is all you really need. Smaller projects can take less, and bigger projects maybe a bit more. It’s always better to aim short than go over. Most of these hammer marks should be the head of the hammer, and maybe a small amount from the claw end. 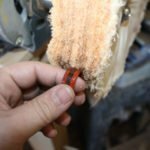 If you are using a different kind of hammer, try it out on scrap and see what the dents look like. Finally, if you have several different hammers, you can combine the looks. Find out what you like, and what kind of pressure it takes to make the look. Then, add it in selected places to your project. Older projects and old wood have a different look. 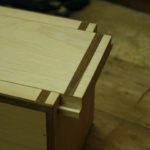 The joinery was different, and the way it was assembled can also look different. One thing that has changed over time is the look of nail heads. You can use that fact to age your wooden pieces. Round head nails are a relatively new thing. Before modern machines made round nails, they were cut from sheets of flat bar stock, and they were square to rectangle shaped. They are not as easy to find anymore, but you still can if you look around. Using some of these nails in key places, and allowing the heads to be visible will instantly age your boards and give them a vintage look. Seeing square nails in a piece is synonymous with older boards, and will sell the age immediately. Anyone that has seen older furniture and older wood knows what square nails look like. They also know that they are older. 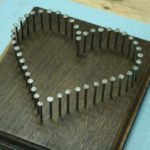 Adding these nails in places where they would naturally hold pieces together is a great way to instantly date your piece. Look online for your square nails. They are sold by the pound in most cases, and they are not cheap compared to regular nails. They are still affordable though. Pickup some that are the right length and diameter for the look you want, and add them to your project. A little trick is to buy shorter nails if you are going just for looks. They are easier to hammer in, and since they are not actually being used for structure, you really only need to see the tops anyway. Another trick is to cut down larger nails and just hammer in the top half an inch or less. Pre-drilling can help this process. Just drill a hole that you can get the nail into, and then tap it home. Make sure that the square head completely covers the round drill hole, and you won’t ruin the story that the nails are original. If damaging the wood surface is not your thing, you can always pick out a rustic and aged color. These are coming back into style really hard, so you can find them anywhere. You can also combine this with other techniques from the list and get a layered look. One of the most common old looking colors is that appliance blue color from a long time ago. My grandmother had appliances that were blue, and they always remind me of age. Adding this color to your project does the same thing. You can also look at historical color examples online, and then have that color made for you as a paint. Remember, older colors were less vibrant than current colors. This is part of what makes them look older. Think about that when you are picking out your look. You may really like those muted colors, and decide to use a couple or more on the same piece. For painted projects and wooden boards, you can also combine sanding as a way to age the look, and make them appear older. This is really easy, and the materials are inexpensive. You only need sandpaper, and your hand or a block. The objective to making the surface older in this case is to simulate the paint having worn off over the years. In order to do this, you need to think about how the piece would be handled in normal use. This is the secret to making realistic age marks. Look to the areas where the piece will receive the most handling. The edges, tops, corners, and anything that would naturally be a hand hold. These spots are going to lose paint rapidly, where places like hard to reach areas, bottoms, skirts, and such will keep it. Make sure to sand away paint in the areas that would normally be touched. This way, you add years to the piece without it looking unnatural. The goal is to add age, not design. The way to simulate age is through picking the right areas to apply the treatment. Dark Walnut Danish Oil is like outdoor aging in a can. When you apply this product, you can go from brand new Pine, to hundred year old barn wood in an instant. It’s like magic. It also applies really easily, and you almost can’t mess it up. Daniel oil is a wipe on finish that has some color added. Dark Walnut is the color, and there are many more available. This one however, is the one that really adds age. The darker color is a little dirty looking, that that’s where the charm comes from. The other nice bonus about this finish is that you are adding color and finish in the same step, which cuts down your time. The color will look really good, and the finish inside the product will help keep it looking that way for as long as possible. If you need so stain a lot of larger boards that are light in color, this is the easiest way. Not only will the process go by quickly, but you will get a very rustic look. The wood will age instantly, and you will really enjoy using the product. This is also a good base layer for the other techniques. Add some dents, dings, imprints, and maybe even a burned edge or two, and you are in business. A can of the finish is super cheap too, and it lasts through lots of projects. Shellac is an old fashioned finish. It has a nice warm glow to the product, and it creates that aged patina that you find on most older furniture. It’s the shellac finishes that age beautifully and create that classic museum piece look. Shellac comes in several shades, but the one you are looking for is amber or orange. Clear shellac will not add the glow, and the really dark stuff can be too much. You can save time by getting it pre-mixed in a can. If you want to mix it yourself, you will need shellac flakes and alcohol. It’s an easy process, but unless you need to mix it to eliminate the wax, or for some other reason, then just buy and use the canned version. For making wood look old, it’s perfect. Apply your shellac with a brush, and don’t mop it on the surface. Apply a thin layer, and then keep on moving to other areas of the board. If you work really quickly, and don’t cover the same spot twice, you can use a smooth rag too. Another trick with shellac is to intentionally make it a tiny bit uneven. You can favor certain areas with a little heavier coat of finish, and then go thin on others. The amber coloring effect will be more or less depending on the area you look at. Shellac is worth experimenting with. It’s relatively simple to figure out, and it’s cheap. Try it out on a few sample boards and see if you like the look. If you do, you have instant age and warmth in a can. A thin layer of shellac over paint is also a good way to age the paint. This works best on lighter colors. Make sure that everything is compatible by working on a test board first. Shellac can typically go over or under anything, but it’s always worth a test run. Another way to target the high traffic areas is to use a dirty glaze. Dirty just means search for a color like dark brown, dark red-brown, black-green, even a black-purple mixture. These glazes give the look of dirty residue. Target the commonly touched areas, and apply your glaze. Glazing is not a super simple process, but you can pick it up with a day of practice and some patience. The trick with glaze is that a little goes a long way. Apply your glaze with a brush, only after wiping off as much as you can. Dip the tip of the brush in the glaze, and then brush a rag until you feel like you have removed nearly all of it. Then, brush the high traffic areas. You will need to work a little on your amounts, and your pressure. Spend some time getting the product on the surface, and getting the right amount. Go for a certain color change, and then try to make that similar all over the piece. When you are done with the glaze, allow it to dry, and then coat it with a clear. Glaze needs to be trapped under a layer of film finish. This can be lacquer, or anything that the glaze maker says will work as a top coat. You can also do multiple layers of glaze, and with different colors. This will create a layered look, and you just coat with clear finish between each layer to seal it. If you build up several layers, you can get some really cool and interesting looks. Glaze can also age wooden projects by simulating the accumulation of dirt in harder to reach areas of the piece. These can be tight corners, or detailed carvings or routed areas. The goal is to make it look as though the piece was not cleaned with much detail by the owner. Router pattern grooves and inside corners are some of the best places to do this. Simply brush on your glaze like in the previous section, and them use a rag to take it off of the smooth areas, leaving it in the cracks. This is easy to do. All you need to do is go light with the rag. Don’t press it into the grooves and corners. Just let it grab the glaze off the smooth surfaces. A little practice and you’ll have it down, and you can do it on many of your wooden pieces. Another thing to think about is gravity. If you are intentionally trying to age your wood pieces with grime, then think about how grime and dust settles. It settles on bottoms. Focus your glaze on areas where the grime would naturally settle. This will give you the best look. To find out more about factory level rustication and aging, look online and find some furniture that already has these marks. Factories have been using these techniques for ages. You can benefit from stealing a technique or two. There are subtle things like cow tails, which can be done with a marker or paint brush. There are also fly specs, which are like little black dots, and those can be done with a toothbrush. Also, there more heavy handed techniques. 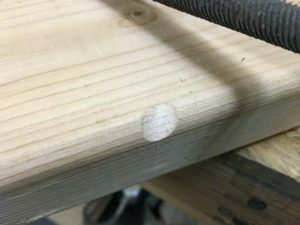 Some factories intentionally add shotgun marks with a tool that has metal dimples on the surface in a shotgun blast pattern. These enter the wood, and make it look like an old tree that was shot while hunting sometime in it’s life. By looking at some of these professional markings, you can come up with ways to make the tools yourself. You can also buy the same tools. 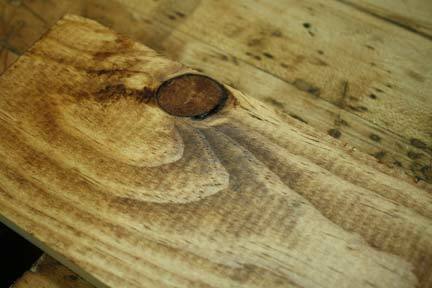 Find markings that you like, and then incorporate them into your wood aging process. Old wood tends to have markings on it. These come from where the wood was made, and even what the wood was used for. 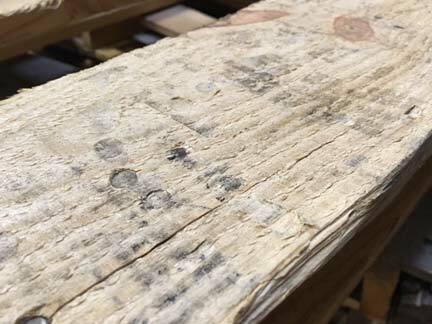 Reclaimed wood is famous for this, and you can find brand marks and company logos sometimes. A well placed brand mark or company logo can be a perfect touch to a piece of wood that you are trying to age. Look online for old logos and old trademarks. These already have an aged feeling, and are perfect to add to your projects. Once you find one or two that you like, place them intentionally in odd places on the wood, or center them if you want them to be a focus. Placing them out of the way makes them less intentional. Centering them makes them a more pronounced part of the wood. You can apply these with an iron on transfer, paint them on, or burn them. A quick cardboard stencil and some spray paint will work in a pinch as well. One way to take your branding to the next level is to make a custom metal brand that you apply with heat. You can order something like this, but since the trademark and logo names are sometimes pretty big, it may be expensive. A better way to add some age with a brand is to make a metal brand yourself. It’s not a difficult process if you have some metal working skills, or you can farm it out. Search for easy to make brands that can be done with simple lines, and you will have the easiest time. This is something you can make with a single strip of thinner metal. You will be able to bend it, and shape it. After that, you just need to get it attached to a handle so you can sue it without burning your hands. To apply the brand, you simply heat the metal design, and then press it against the wood. Go for one touch for several seconds, and try not to move the brand. The more you move it, the more blurry the image will become. When you make distressed wood, the goal is to create a rustic wood look. Nature is the king of creating that look, and it doesn’t matter the type of wood. You will have to wait, but to the patient goes the spoils. There is something charming about an antique project that has a sun weathered look, and a timeless beauty. The outdoors does this for you without you having to lift a finger, but you will have to spend time waiting. Depending on where you live, it can take a few or several years to allow the sun and weather to do this process for you. If you have the time, start leaving wood outside, but off the ground. Check it periodically so you don’t get bugs, and don’t cover it. Let the sun, rain, snow, and wind to their work. At some point, when you like the look, you will have a big pile of rustic and distressed wood, all compliments of nature. Wood like this can be used to finish an exterior wall, or make projects. Since the wood has already been left outside, an exterior wall with large boards can be a fun statement. Especially if you add some painted wood, with rustic painting techniques, you can have a nice focal point for a backyard. Steel wool and vinegar stain has been around for a very long time. This recipe simply creates a solution that when applied to wood, turns it a dark color. The recipe is easy, and you might already have everything you need to make it. The ingredients for this type of stain are easy. 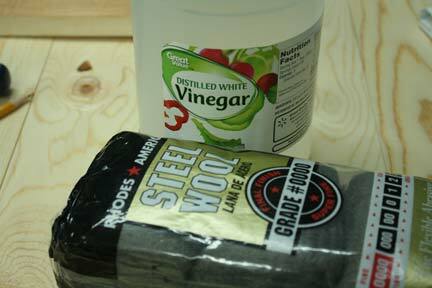 You only need some white vinegar from the grocery store, some fine steel wool (like 0000) and a glass jar with a lid. After you have everything, it’s time to make it. Fill the jar half way with loose steel wool pads. Then, pour enough vinegar to cover them, and pace the lid on loosely. It’s important that air can escape. Put the jar somewhere safe and out of the reach of kids and pets for a couple days. Check on the mixture, and when it’s dark brown it’s done. All you need to do now is strain it, and apply it with a brush or a rag. Your wood will turn dark, and it’s all natural from your homemade stain. Another fun way to add some character to distressed furniture or wood for making projects is using red wine. Red wine leaves stains. Sometimes, these stains can be placed intentionally to add charm. You can do this before or after you make the project. It’s easier to randomly splash the wood before you make it into something. This way, it looks like you used older boards right from the beginning. Buy cheap wine, and test it out in a sprayer. The goal is to make it look like someone spilled wine on the project a long time ago, and took forever to clean it. Splash or spray your wine in a couple spots, and then let it sit long enough to add color. The goal of wood aging to make it look as though your wood lived in the country as an old barn or project for a hundred years. It’s all about looking natural. You won’t sell the look if you can tell it’s fake, and you won’t fool anyone else either. Not that the goal is to deceive anyone. Nearly everyone knows that when you buy new furniture or woodworking, that you are getting something that was just made, even if it looks a hundred years old. That’s good news. It’s really about making sure that the look is consistent. Old wood has a look, and when you learn how to distress wood to give it that look, always think natural. It’s better to go easy and make it look natural than to go over the top. 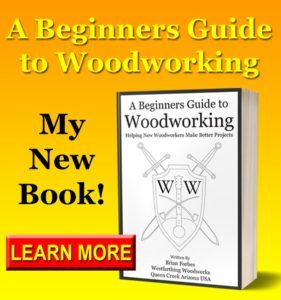 Learn How to be the Best Woodworker You Can Be! Available Now on Amazon! Your homework is to head out into the shop and try at least one of these ways to make wood look older than it really is. Odds are you already have at least one of the ingredients you need. Don’t red over five thousand words of a post and do nothing. You have been with me this long, and I promise if you go farther you will be happy. Pick out a technique or two, and try them out this week. Today is even better. When you do, you will see what it does to the surface. You can start combining techniques, and see what kind of looks you can create. 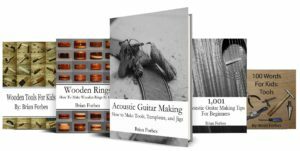 As you practice, you will become better and better, and you will be able to make rustic looks that seem to be a hundred years old. Here’s the list one more time. 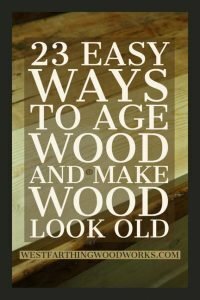 If you have any questions on 23 Easy Ways to Age Wood and Make Wood Look Old, please leave a comment and I will be glad to answer them. Happy building.